Have you considered just how great Rattan Furniture can be as an alternative furniture idea in the conservatory? With the prospect of being able to match your outdoor patio furniture with your conservatory furniture Rattan conservatory furniture offers the perfect tie in, with sleek subtle contemporary designs available to suit any conservatory setting. If you are looking for furniture which offers comfort and luxury then the range of conservatory furniture available made from rattan is vast with something to suit most tastes and budgets. The range of fantastic products can be from as simple as a natural rattan chair through to a full suite including a convenient occasional coffee table. Putting stylish classic furniture in your garden need not cost the earth. Rattan garden furniture offers outstanding value for money along with stylish great looks that offers the opportunity to add a touch of elegance and sophistication to your outdoor area. Whether that’s on the patio or placed in a favourite spot in the garden. Regardless of the look you are trying to achieve, you will find something to suit from the variety of styles, sizes and materials available. 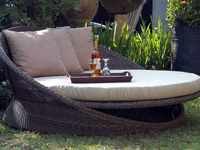 Rattan Garden Furniture offers luxurious sophisticated furniture for your patio or garden area. 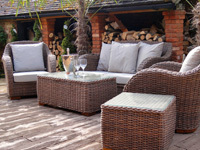 Garden furniture sets made from rattan can be found in all shapes an sizes include modern tables and chairs such as the Havana range which offers a number of options for almost any sized garden through to relaxing sun loungers and interesting, alternative garden options such as white Apple day bed which would grace any garden area. Outdoor rattan furniture offers a durable strong option together with a contemporary style that will provide a long-lasting solution to your garden furniture needs. It is manufactured to the highest standards from a durable synthetic substance called Ecolene that enables the furniture to be used outdoors. With a little maintenance, such as a quick wipe over with a damp cloth and an occasional clean with a mild detergent every three months or so, your rattan furniture is useable all year round for times when the sun shines. With the ability to withstand the rigours of alternating seasons, outdoor rattan furniture is both UV and water resistant, offering protection against the elements. Such protection offers the advantage of being able to leave rattan furniture outside and not needing to find indoor storage areas for your furniture during the autumn or winter months. 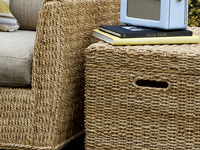 With rattan garden furniture becoming more and more popular, now is a great time to invest. The range of furniture allows you to add originality and exciting ideas to your garden whilst remaining confident that any investment will last for many years to come.